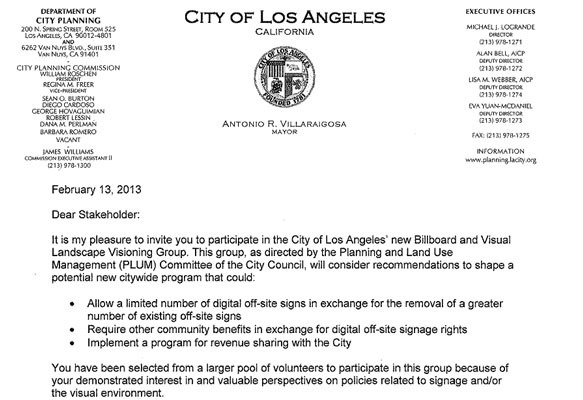 It would probably be unfair to say that the city’s “Billboard and Visual Landscape Visioning Group” accomplished nothing in its three recent meetings to discuss a regulatory framework for allowing digital signage. After all, community activists and billboard company representatives sat across the table from each other without coming to blows or resorting to invective to describe each other’s wildly divergent views of the benefits of outdoor advertising. However, the group’s intended mission–to figure out ways to allow digital signage in exchange for revenue to the city and the removal of some conventional signs–was doomed from the start by the glaring issue of the 103 digital billboards now operating on city streets. As anyone who hasn’t been out of the country for the past year knows, the state appeals court deemed those signs to have been put up illegally and ordered a lower court judge to revoke their permits. In turn, Clear Channel, which owns 84 of those signs, threatened to sue the city for more than $100 million in damages if any attempt is made to shut off and remove the signs. Texas-based Clear Channel has also mounted a highly-visible PR campaign to convince people that turning off the digital billboards would constitute a serious loss for L.A. businesses, non-profits, law enforcement, and the cause of traffic control and safety. Those two companies had three seats on the 32-member visioning group, which met twice in February and once earlier this month. The city Planning Department and the consulting firm that facilitated the meetings are scheduled to present a report on the meetings to the City Council’s Planning and Land Use Management (PLUM) committee on March 26 at 2 p.m. The group also included representatives from billboard companies Lamar Advertising, Regency Outdoor, Van Wagner, and Summit Media, the latter the small company whose lawsuit against the city seeking to void the aforementioned agreement led to the ruling that the digital billboard permits should be revoked. While all those companies except Summit have indicated that they would like to put up some digital billboards, there was no rush to side with Clear Channel and CBS. In fact, working group members representing Regency and Van Wagner expressed a desire for a “level playing field,” which clearly doesn’t mean giving Clear Channel and CBS a head start with the highly lucrative digital billboards now beaming their ads at drivers and pedestrians on city streets. With this lack of unanimity on the part of billboard companies, and the adamant opposition on the part of many community members to preserving the existing digital signs, the working group had little of substance to find as common ground. Of course, some members of the City Council are not looking at digital billboards through a prism of business fairness, legality, or the effects on communities, aesthetic and otherwise, but as potential sources of revenue to help staunch the city’s flow of red ink. One can point out to any councilmembers with short memories that the issue of digital billboards was settled back in 2002, when the council approved a ban on new off-site signs and modifications to existing ones. There were exceptions to the ban, the primary one being signs in special sign districts, but after prolonged litigation the city’s right to limit new signs to these districts was upheld by the courts. And in January of this year, the PLUM committee approved an extensively-revised sign ordinance that continued the ban and tightened up the process for establishing sign districts–by requiring billboard takedown in surrounding communities, for example. That ordinance is expected to be sent to the City Council within the next month. So billboard companies that want digital billboards, or city council members who say they want digital billboards in their districts have a mechanism to do so through sign districts. That mechanism has been upheld by the courts, and sign districts are not only limited to high-intensity commercial areas but require thorough findings and public hearings in which regulations can be crafted to mitigate the effects that have so negatively affected communities and residents elsewhere. Whether City Council members panting after sources of new revenue will take cognizance of the fact that this ordinance was approved by the City Planning Commission almost exactly four years ago after many hours of public hearings and debate, and that the PLUM committee held at least six meetings on it before final passage remains to be seen.